Search Keywords (Product Editor Field).. The Search Keywords field is used to input a comma-separated list of keywords that will be referenced by the storefront's built-in search engine. The keywords entered in this field are never revealed to customers or displayed publicly in the storefront. Search keywords are not case-sensitive. 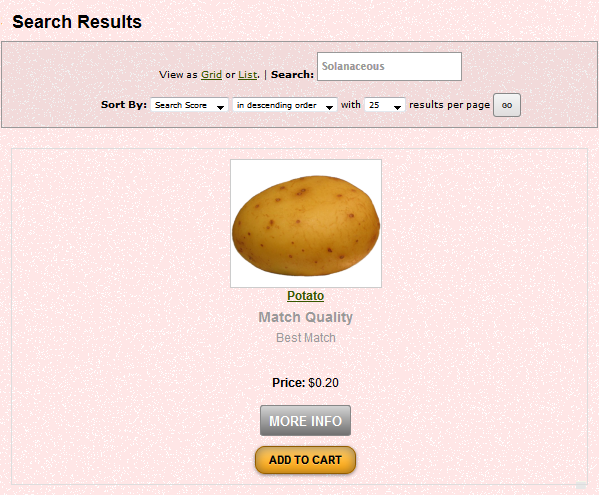 Search Keywords set for the Potato product. Searching for any of these keywords will result in the Potato product. Both searches, for Potato or Solanaceous, will bring forth the Potato.